This ship, Cunard's second of that name, was the sister of Saxonia (II) / Carmania (II) and Carinthia (III), and Ivernia (II) / Franconia (III). Like them, she was built by John Brown & Co. of Glasgow. Launched in 1956, she made her maiden voyage on 5 June 1957, from Greenock to Montreal. 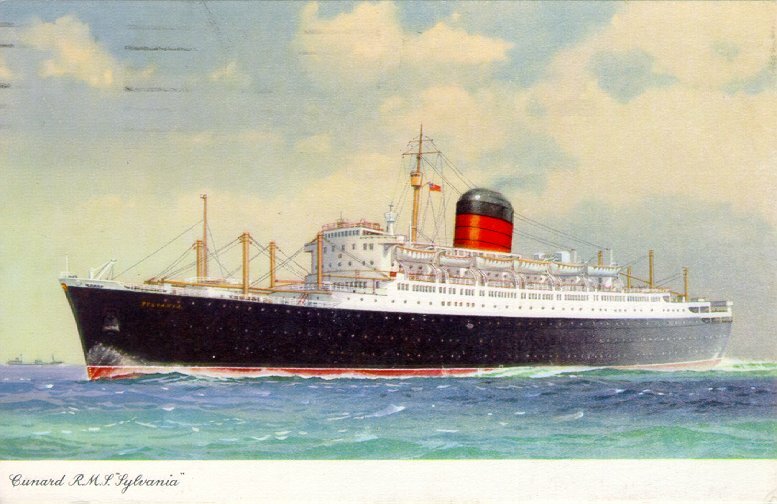 She and her three sisters then maintained a weekly service to Canada from Liverpool (Sylvania and Carinthia) and Southampton (Saxonia and Ivernia) until 1961. Sylvania then replaced the recently-retired Britannic III (also shown on these pages) on the Liverpool-New York service. She later earned the distinction of making Cunard's final regularly scheduled sailings both on that service (24 November 1966) and on the Southampton-Canada service (20 October 1967), as well as the final Cunard passenger sailing from Liverpool to North America (Halifax and New York) on 30 November 1967. (This last was also Sylvania's last Atlantic crossing for Cunard.) Also in 1967, she took part in an experiment where hovercrafts were loaded aboard Cunard liners, and was used for a fly-cruise service at Gibraltar while the hovercraft service was tested. She was then used only for cruising until Cunard sold her to Sitmar in 1968 and she was renamed Fairwind. Renamed Sitmar Fairwind in 1988, she and the rest of Sitmar were acquired by P&O later that year, and she was again renamed Dawn Princess for P&O's Princess Cruises. She was sold again in 1993 to V Group of Monaco and renamed Albatros. She remained in service under that name for Phoenix Seereisen until December 2003, when it was determined that necessary repairs to her machinery would be cost-prohibitive. She was then renamed Genoa and sailed for Alang, India, where she was scrapped the next year. Sources: Haws' Merchant Fleets; Bonsor's North Atlantic Seaway; Miller's Pictorial Encyclopedia of Ocean Liners 1860-1994; Maritime Matters web site (www.maritimematters.com).